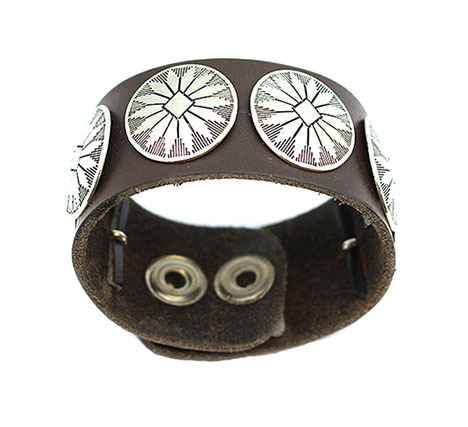 This cuff leather bracelet has 7 pewter conchos and two snaps for adjustable closure. Leather measures approximately 8 1/8" long by just under 1 1/4" wide. Snaps measure about 7" and 7 5/8" wirst size. It is Navajo hand crafted by Carson Blackgoat. Conchos may vary in design. You may not get the design that is pictured. Also available in black leather. Choose leather color when ordering.